She has a style that can take you to all heights, through many times and places with her believable choices of songs, from the best of standards to Pop/Jazz sounds of the past, present, and, definitely the future...She can move an audience with the sounds of big bands, or acoustically with just the accompaniment of guitar, rhythm, or just a Baby Grand Piano...She is The Queen of Vocal Control, as only the trained and experienced can accomplish. 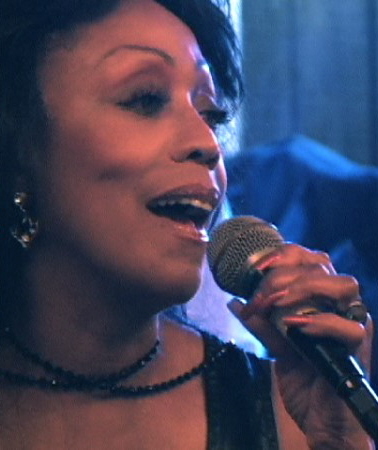 Marva Josie has earned acclaim as a gifted vocalist from the best of Jazz to those of Operatic and Classical renown. Her soaring 5 1/2 octave range is an example of her ability to take a listener in any direction...much due to her training from the age of eight in Opera and the Classics. She gave her first concert at age nine while a student of music and dance at Clairton Pennsylvania, a suburb of Pittsburgh, where many greats in music received their acclaim...such as: George Benson, Lena Horne, Earl "Fatha" Hines, Errol Garner, Billy Eckstine, Mary Lou Williams, Shirley Jones, etc. She is proud to join the list. She has also performed as an invited, guest soloist at the White House for Presidents Gerald Ford and Jimmy Carter, and for such notables as the Shah of Iran, Secretary of State Henry Kissinger, President of France Giscard D'Estaing. She has also appeared as a guest singer on the Tonight Show w/Johnny Carson, Good Morning America, The Merv Griffin Show, The Mike Douglas Show, and The Joe Franklin Show. Foreign television appearances include Italy, Germany, Australia and Brazil, as both a soloist and with the Earl Hines Orchestra. Marva Josie...has the unique ability to bring a song to its lyrical and musical best. She is also trained as an actress, enabling her to become an innovative "interpreter" of lyrics. She performed in many "off-Broadway" plays while studying Voice Harmony, and Theory, during her stay in New York City, and put her administrative and creative abilities to use behind the mic and behind the scenes in theater, video, and record production. She also became involved in the production side of theater and recordings. Her many albums as soloist and featured vocalist with Earl Hines are treasured "gems" by record collectors all over the world. Among others, she has been managed/produced by Lee Magid, who guided the careers of such notables in music as Della Reese, Lou Rawls, Gloria Lynne, Earl Grant, Al Hibbler, Marlena Shaw, O.C. Smith, etc., a singer to be reckoned with, Marva Josie is a singer that cannot be categorized...a singer that can sing anything...in any groove...be it Classical, Jazz Sweet, Soulful, Blues, Operatic, or Popular. Her voice is the individual and original instrument composers yearn for. She's a singer in a class of her own. Marva has a universal approach that is embraced all over the world. She is a chameleon of sound with a voice that will captivate listeners of all cultures and all ages for all time. Marva is working on her new CD that will be out before the end of the year. Click below to watch videos of Marva performing.